バスからのアクセスも観光ポイントへの立地もとてもいいです。また、受付の方がとてもオープンマインドなので気軽に話しにいけました。バルセロナに戻ってくるとしたら、ここに戻って来たいと思える場所です。 The location of hosetel is very accessible from the AERO bus stop and some famous sightseeing spots. I went out so many times and had a birthday celebration with my my roommates. OMG, it was a fanblous experience!!!! 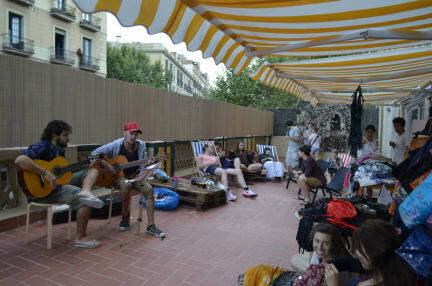 You can find a joy here, 360 hostel Barcelona Arts&Culture. I stayed with here only for one night but really felt being at home : ) The staff is helpful and friendly and access to the train is close. And they served free paella!! It was good. I like it. I will come back here if I travel Barcelona !